ASP.NET 4 is the principal standard for creating dynamic web pages on the Windows platform. 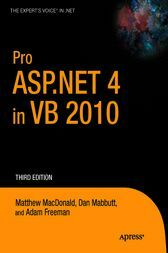 Pro ASP.NET 4 in VB 2010 raises the bar for high-quality, practical advice on learning and deploying Microsoft's dynamic web solution. This edition is updated with everything you need to come to grips with version 4 of ASP.NET, including coverage of ASP.NET MVC, ASP.NET AJAX 4, ASP.NET Dynamic Data, and Silverlight 3.